Originally intended to be of Gothic design, St Peter's was built in a Greek Revival style, opening in 1824. St Peter's Church appears on the 1890 Ordnance Survey map available at British History Online - http://www.british-history.ac.uk/mapsheet.aspx?compid=55193&sheetid=10098&ox=2254&oy=1093&zm=1&czm=1&x=433&y=207. The first design submitted in 1824 by the Birmingham partnership of Rickman & Hutchinson was in a Gothic style with some similarities to Goodwin’s Holy Trinity, Bordesley which had been completed the previous year. However, the design that was accepted by the Church Commissioners was a building in Greek Revival style. 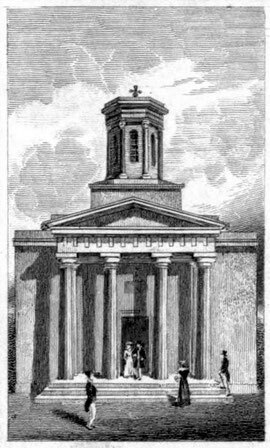 St Peter's was built in the Doric style and had an octagonal turret with a cupola. The design is said to have been modelled either on the Choragic Monument of Lysicrates in Athens or on the Tower of the Winds in the Temple of Minerva also in Athens. Large blocks of stone from quarries at Guiting in Gloucestershire were used, some of them weighing more than seven tons The church had a massive Doric portico. The cost of construction was £19 676 which was some £800 under budget. Built in an heavily populated working-class area of the town to accommodate a congregation of 1900, most of the seats were free. St Peter’s was consecrated in 1827. In January 1831, just over three years after it opened, a fire broke out in the church which destroyed the roof and almost all of the interior of the building. Much of the belfry was also burned. During the rebuilding the congregation met in the National school in Peck Lane. This street ran down from New Street east of Stephenson Street before New Street Station was built. The restoration of the church was not completed until 1837. As the population moved out of the central wards, it was decided to close the church in 1899, After its demolition shortly afterwards, the endowments transferred to the the new church St Peter's, Spring Hill which opened in 1901. St Peter's parish was merged back into that of St Philip's.